At Javelin, we love to invest in technology that works FOR people, instead of AGAINST them. The reasons are simple…it feels good to help and empower others AND it is highly lucrative because often these technologies are mass market by definition. They are trying to lift up the greatest number of people versus only helping the already wealthy (corporations or people). Within the Javelin portfolio, Thumbtack is a great example. They provide products and technology to Small-Medium Sized Businesses (“SMBs”) and independent contractors to reach more customers, generate more revenue, and earn a good living, while doing what they love. As technology is rapidly scaling, automating jobs, and leaving many people in the dust, it was a breath of fresh air to invest in a company that helps people compete and stay afloat in this day and age. Similarly, at MasterClass, we build content that democratizes access to genius, which before was only accessible to the very few, and we make it available to people all over the world. This can inspire them to start a new career or hobby, or hone their existing craft, unlocking a wave of new human potential. Both MasterClass and Thumbtack seek to inspire and empower the masses. So when we met Joseph Gordon-Levitt (“Joe”) and Jared Geller from HitRecord, we were instantly drawn to their noble ambition to bring as many people into the creative process as possible across various media formats, such as video, music, writing, and graphic art, and arm them with software tools and a vibrant community to encourage their creative passions. It perfectly fit our mental mold of technology helping the greater good, which if successful, would also result in a successful, valuable and transformational business. Via our investment in MasterClass (see more here), we have seen first hand, consumers’ desire for inspiration and how effective original content can be at delivering that creative spark. HitRecord takes this one step further, as it offers inspiration for creatives but also tangible, high visibility projects where they can get their hands dirty, experiment, and hone their craft. Not to mention get support from a community of over 700,000 members (and growing!) to help them on their creative journeys. Joe is not your typical Hollywood actor. This became apparent in our first meeting. Yes, we’ve all seen him in legendary roles like “Snowden”, “Dark Knight Rises”, “Inception”, “500 Days of Summer”, “50/50”, and many other critically acclaimed movies. He’s one of the best actors on the planet. But acting is not the main thing that defines him. He shies away from the glitz and glamour of the entertainment lifestyle. He’s a devout family man, who genuinely cares about people and doing right by them. One of his biggest beliefs is that there is creativity hidden within every human being, and he is passionate about sparking that creativity and enabling it to come to the surface because it is a genuinely good thing for the world. The process of being creative, regardless of whether the end product is good or not, is something that gives people joy, confidence, and unleashes their imaginations for even more creativity and innovation to come out. He also believed that technology and the internet can provide the tools and the perfect forum for this to happen. This passion led Joe to start HitRecord with his brother 9 years ago, and then convince his good friend Jared Geller, who shares the same passion, to come along for the ride. With their own money and creative bootstrapping, Joe and Jared have been able to grow HitRecord to a large and vibrant community of artists, without a single dollar of outside investment. At Javelin, this is exactly the type of passion, dedication to mission, determination, and scrappiness we look for in founders. We were captivated by their vision and couldn’t stop thinking about it. As we dug in further, we realized just how hard of a problem HitRecord was solving. 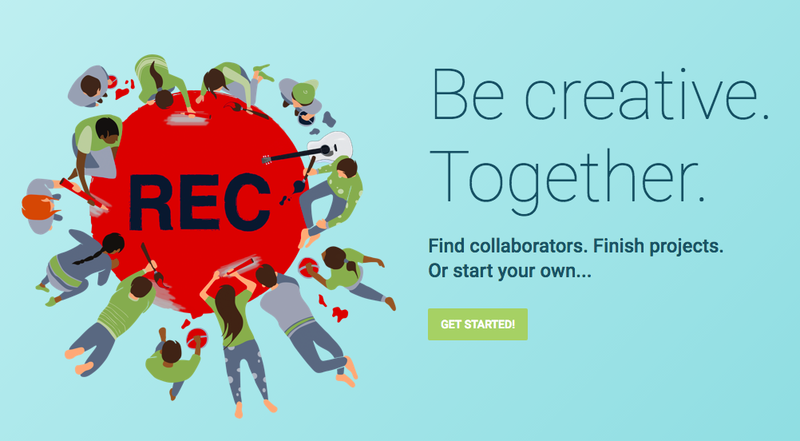 The task of having many creatives collaborate to create a cohesive artistic project is not easy — this is the hard problem that HitRecord has solved! Joe and team have shown a remarkable ability at genuine community building, amassing a membership of over 700,000 creatives. But in addition to growing and managing an online community, you have to build project management software, collaboration and messaging tools, payment rules and capabilities to make sure all artists are paid fairly, and much more. This was hard stuff with a lot of nuance. It took HitRecord a lot of trial and error to get this right, and explained why we were not able to find many other examples of collaborative media sites at scale. It became apparent to us that HitRecord was a compelling investment opportunity with a product driven barrier to entry, a significant “cold start” problem that HitRecord had already overcome, a community that we believe would be very difficult for someone else to replicate, and a demonstrated capability to create fantastic content across several media types (video, music, graphic art, writing). We firmly believe that companies which can utilize new technologies and the internet to make compelling content in a distributed and efficient way will succeed in a dramatically shifting media landscape. There is currently a tectonic-shift happening in the content world. New entrants such as Netflix, Amazon, Apple, YouTube, Hulu, and Facebook, are gearing up to spend tens of billions of dollars on originals. Incumbent powerhouses (HBO, Comcast-NBC, etc.) are scrambling to compete. There are a lot of dollars chasing the best content, and bidding wars are bound to erupt. Companies that figure out how to create differentiated content at scale, cost-effectively, will be in phenomenal positions to take advantage of this shift. Traditional studios and production houses are at risk of being disrupted since they will not be able to make compelling content at the volume or efficiency, that software and crowdsourcing can deliver. HitRecord, on the other hand, is strongly positioned to be one of the winners given their powerful combination of software and crowdsourced creativity. This investment will allow them to double down on their approach, to build a platform with even better software to make the process of starting a project, collaboration, end product creation, and consumption even easier and with the greatest possible reach. With over 2 million pieces of original content, including an Emmy winning variety show (“HitRecord on TV”), partnerships with large brands like YouTube Originals, Ubisoft, LG, and Samsung, and close to $3m paid to their creators in a fair and equitable way, HitRecord has proven that they can leverage software and online collaboration to make compelling content and be a category leader at the frontier of new media models. Thus, we are proud to lead the Series A financing for HitRecord and help Joe on his mission to bring out the creative in as many people as possible and give them a venue to do what they love! Special thanks to our fantastic co-investors — Omar and Joe from Crosslink Capital, Jason at Advancit Capital, David Rogier, CEO and co-founder of MasterClass, Kevin Lin, co-founder of Twitch, and Steve Chen, co-founder of YouTube. P.S. please check out Joe’s funding announcement video to the HitRecord community below…it’s excellent.